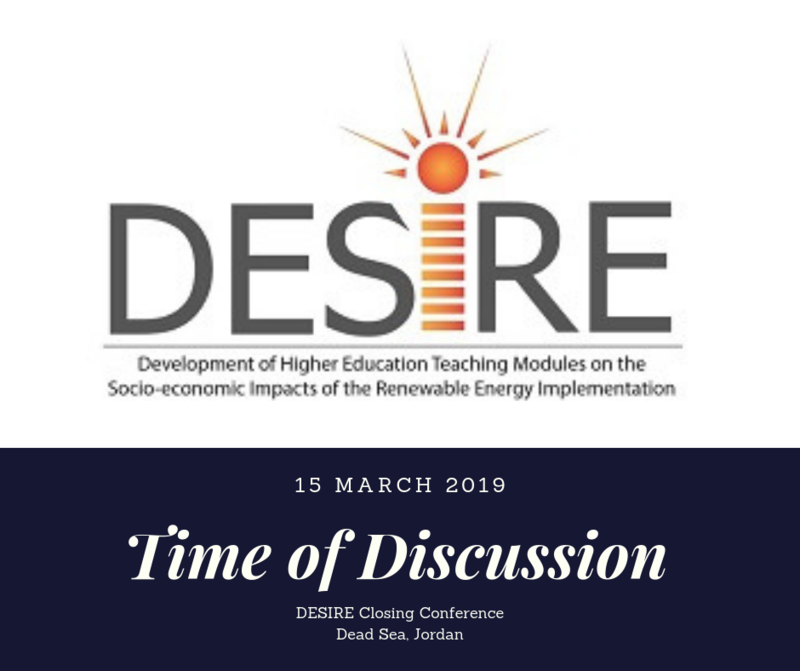 The DESIRE team invited universities from the northern region of Jordan to attend a dissemination session of the outcomes of project in an attempt to involve them in the post-project era and have these universities incorporate the created modules to their curricula. Industry take holders were also invited for a panel discussion to bridge the game between academic know-how and industry needs. The early session of the dissemination workshop was interactive with the audience, instructors and students, discussing various renewable energy topics and learning how to use the e-learning platform. The project coordinator, Professor Ala’aldeen Al-Halhouli of the German Jordanian University (GJU), welcomed the audience and explained what the DESIRE project is and how can the audience gain knowledge and experience from it. Dr. Mohamad Khawaja (GJU) shared the dissemination plan and the previous outreach programs such as Capacity Building sessions, Training of Trainers, and Dissemination Workshops. Dr. Khawaja then introduced the Advanced Modules and their benefits to various stakeholders, technical and nontechnical alike. Dr. George Konstantinou of the University of Cyprus (UCY) introduced the Technological Innovation on Renewable Energy Sources modules then Dr. Khawaja introduced the Job Creation in Renewable Energy and Energy Efficiency modules. Both session were interactive with the audience with plenty of questions and answers. Mai AL-Zu’bi (GJU) introduced the e-learning platform in details as the audience were following her instructions via their computers, tablets, and smart phones. The session was successful as students and instructors were able to log in and learn how to access all the modules’ materials. Preceding the e-learning platform’s session, Professor Moussa Al Samara of Tishreen University (TU) introduced the Health, Well-Being, and Environmental Quality module and the Climate Effects, Environmental Management, and Sustainable Development module. The late session of this dissemination workshop was a panel discussion among panelists and audience members. The panelists were Professor Ala’aldeen Al-Halhouli (GJU), Professor Suhil Kiwan of the Jordanian University of Science and Technology (JUST), Dr. Iyad Sartawi of the Energy Services Center, Dr. Aziz Al-Muhtaseb of the Royal Hashemite Court, and Dr. Louy Qoaider of the Deutsche Gesellschaft für Internationale Zusammenbeit (GIZ) GmbH. The main goal of the discussion was to raise awareness of the industry needs and how universities in Jordan can address them.